I've always thought of git reset and git checkout as the same, in the sense that both bring the project back to a specific commit. However, I feel they can't be exactly the same, as that would be redundant. What is the actual difference between the two? I'm a bit confused, as the svn only has svn co to revert the commit. From http://think-like-a-git.net/sections/rebase-from-the-ground-up/using-git-cherry-pick-to-simulate-git-rebase.html, checkout and reset can emulate the rebase. 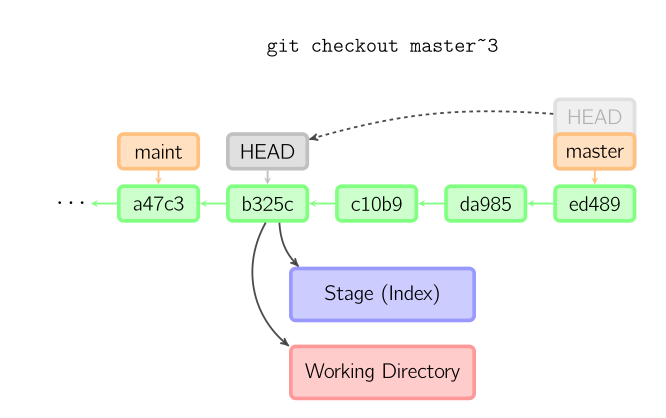 git checkout is about updating the working tree (to the index or the specified tree). It will update the HEAD only if you checkout a branch (if not, you end up with a detached HEAD). By comparison, since svn has no index, only a working tree, svn checkout will copy a given revision on a separate directory. 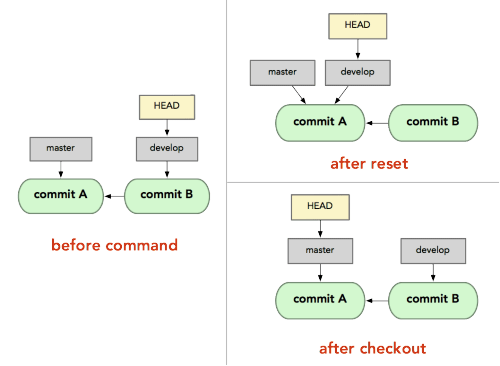 All those three working tree modifications (svn checkout, update, switch) have only one command in git: git checkout. 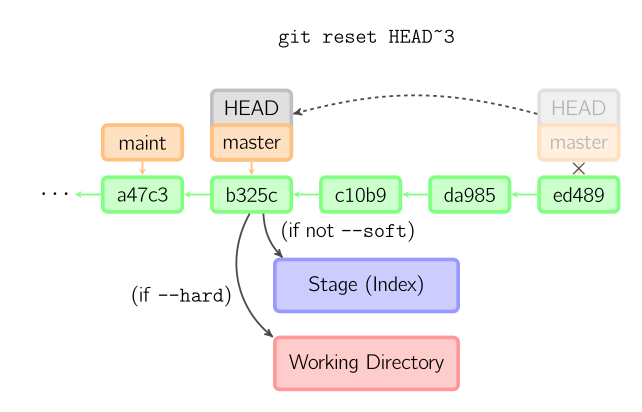 But since git has also the notion of index (that "staging area" between the repo and the working tree), you also have git reset. Thinkeye mentions in the comments the article "Reset Demystified ". For instance, if we have two branches, 'master' and 'develop' pointing at different commits, and we're currently on 'develop' (so HEAD points to it) and we run git reset master, 'develop' itself will now point to the same commit that 'master' does. On the other hand, if we instead run git checkout master, 'develop' will not move, HEAD itself will. HEAD will now point to 'master'. So, in both cases we're moving HEAD to point to commit A, but how we do so is very different. reset will move the branch HEAD points to, checkout moves HEAD itself to point to another branch. The first paragraph of this answer, though, is misleading: "git checkout ... will update the HEAD only if you checkout a branch (if not, you end up with a detached HEAD)". Not true: git checkout will update the HEAD even if you checkout a commit that's not a branch (and yes, you end up with a detached HEAD, but it still got updated). git checkout a839e8f updates HEAD to point to commit a839e8f. The second bullet has a misconception about what HEAD is in will update the HEAD only if you checkout a branch. HEAD goes wherever you are, like a shadow. Checking out some non-branch ref (e.g., a tag), or a commit directly, will move HEAD. Detached head doesn't mean you've detached from the HEAD, it means the head is detached from a branch ref, which you can see from, e.g., git log --pretty=format:"%d" -1.
detached will still show (HEAD, but will not have an arrow to a branch ref. In their simplest form, reset resets the index without touching the working tree, while checkout changes the working tree without touching the index. Once you start adding parameters it is true that there is some overlap. checkout is usually used with a branch, tag or commit. In this case it will reset HEAD and the index to the given commit as well as performing the checkout of the index into the working tree. Also, if you supply --hard to reset you can ask reset to overwrite the working tree as well as resetting the index. If you current have a branch checked out out there is a crucial different between reset and checkout when you supply an alternative branch or commit. reset will change the current branch to point at the selected commit whereas checkout will leave the current branch alone but will checkout the supplied branch or commit instead. Other forms of reset and commit involve supplying paths. If you supply paths to reset you cannot supply --hard and reset will only change the index version of the supplied paths to the version in the supplied commit (or HEAD if you don't specify a commit). If you supply paths to checkout, like reset it will update the index version of the supplied paths to match the supplied commit (or HEAD) but it will always checkout the index version of the supplied paths into the working tree. 1. Use reset if you want to undo staging of a modified file. 2. Use checkout if you want to discard changes to unstaged file/s. Atlassian give us an excellent explanation about git reset, git checkout and so, git revert. In this article, is explained the different uses of these commands on a different levels - file, staged snapshot and commit. The key difference in a nutshell is that reset moves the current branch reference, while checkout does not (it moves HEAD). See also VonC's answer for a very helpful text and diagram excerpt from the same article, which I won't duplicate here. Of course there are a lot more details about what effects checkout and reset can have on the index and the working tree, depending on what parameters are used. There can be lots of similarities and differences between the two commands. But as I see it, the most crucial difference is whether they move the tip of the current branch. The two commands (reset and checkout) are completely different. If X is a branch name, checkout X will change the current branch while reset --hard X will not. Not the answer you're looking for? Browse other questions tagged git git-checkout git-reset or ask your own question. How to checkout commit in GitKraken?